DELTA launched its new wellness program in April 2018. Our program is designed to improve employee health and improve our organization’s effectiveness with goals to help create a worksite culture of health and boost and maintain employee morale. Alexis Simison presented the wellness plan to the DELTA Council on February 5, 2018, and it was well received. We installed a whiteboard in CTI Suite 230 for announcements about the Wellness program, tips for healthy living and more. DELTA solicited a Wellness Leader Sign Up Sheet on April 9, 2018, to survey staff on their activities of interest. 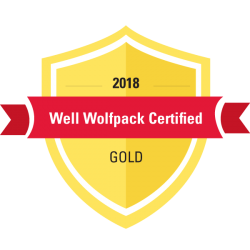 DELTA submitted its application for the Well Wolfpack Certified Organization in April 2018. We earned points in the areas of Active Workplace, Nutrition, Emotional Wellbeing, and Culture of Wellness and scored a 91.8% for our activities. DELTA received the Gold Level Certification in July 2018. As part of the Wellness program, DELTA staff coordinate lunch-time lunch and learns, stretching, yoga, disc golf, pop-up activities and more. NC State and community experts come to share their expertise as well. View a schedule of the DELTA Wellness Events. If you are interested in signing up for the Wellness Committee or have an idea for a wellness session, complete this form. View the DELTA Activites Committee calendar of events.